BEIJING, China, Jul 21, 2017 (SEND2PRESS NEWSWIRE) -- Fengtao Software announces its Summer Holiday Special Offer, offering a rarely seen chance for users to purchase the lifetime version of DVDFab All-In-One package and DVDFab Movie Server at only $479. On July 21, Fengtao Software, the industry leader in the field of DVD, Blu-ray and video backup solutions, announces its Summer Holiday Special Offer. 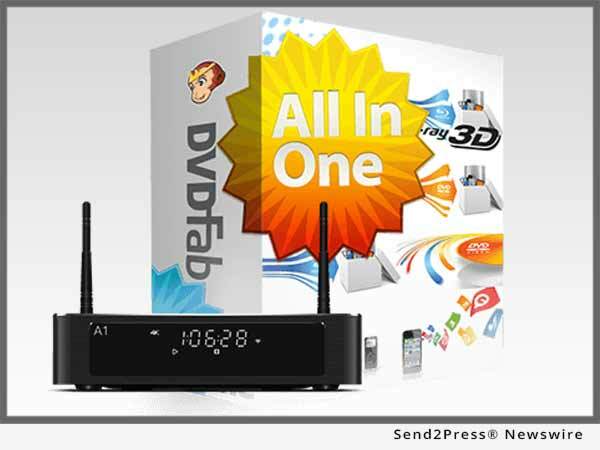 Offering a rarely seen chance for users to purchase its best-seller of all time -- the lifetime version of DVDFab All-In-One package -- and the stunning 4K UHD Blu-ray Player -- DVDFab Movie Server -- together at only $479, $119 less than buying the two products separately, and another storewide 25 percent coupon applicable on all the shareware software products. Read on for the detailed information. DVDFab Movie Server is the recent achievement of Fengtao Software in the field of home multimedia appliance. It is designed as a perfect life companion to the company's multimedia software products DVDFab, as it allows its users to directly output the DVDFab 10 copied ISO files, including DVDs and Blu-rays, to a 3.5 inch SATA hard disk drive inside the Movie Server. With future versions of DVDFab 10 and the firmware upgrades of the Movie Server, more copy modes and modules are to be supported. By doing so, users can easily manage and organize their movie collections with the smart Poster Wall feature, and watch them with native menu support, all in one place.